Any discussion on orgonite would be flawed without first explaining what orgone is. Discovered by Wilhelm Reich, it’s essentially what the Chinese would call chi. He further divided it into good orgone, and bad orgone (the bad he referred to as DOR, detrimental orgone). When you use layers of conducting and insulating materials, they begin to function as an orgone accumulator. Reich found that in certain situations negative orgone could also accumulate in some of his prototype devices. DOR is incredibly unhealthy and a person who absorbs too much will become quite ill, but the diseases it stimulates would be where the person is already the weakest. 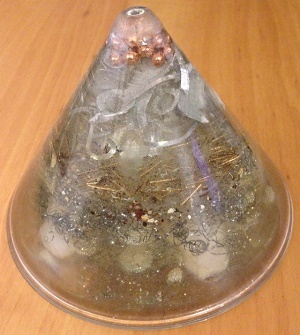 Orgonites are exceptional in that they always produce good orgone, or healthy orgone. Orgonite was discovered around the year 2000, although some say that a few have known about it for longer, used as a fishing weight apparently. 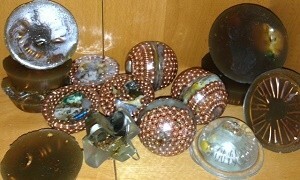 Orgonite as we know it now was first made by Austrian Karl Welz in the early 90’s . He improved on Reich’s orgone accumulator by creating a device made of metal particles cast in an organic resin. Unlike Reichs accumulator which accumulated both positive orgone & deadly orgone. Welz’s “orgone generator” turned Deadly Orgone into Positive Orgone. Welz was the first to call it orgonite. To create a proper orgonite you need to get the proportions correct. Reich discovered that the proportion of carbon to metal is what makes it generate a field. The proportions are 50% resin, 25% quartz (any size or type) 25% metal, (also any type, although varieties of metals that are beneficial to human biology or are very conductive are preferable to aluminum) . Variations in types of metals and silicates yield differences in properties. In the course we teach in Calgary, orgonites are created by each student using a variety of gem stones, metals, and resins. You learn the properties of the different options, as well as how to determine what particular gemstones, metals, and resins will create the particular orgone flow that will provide the positive energy you need. You will make a basic one for protection from electro-magnetic fields. You can then begin to add to the basic recipe and create ones that provide emotional, or spiritual protections. You can make a third one that provides the energies for mental clarity and intention. Come play and take home your own. We supply all the supplies, molds, resins and stones you need. Next class is Monday April 4. Take a day off work and come play. Your health and happiness will get a boost. I was wondering when the next orgonite class will be? Hi Melanie, Because of the weather, we won’t have another one until Spring. I will be doing one in Abbotsford at the end of Oct.